This is a nice book. I don't mean that in the "This was so dull I can't think of a better word to say." I mean in the sense that the lead characters, Mark and Kate, are nice as are most of the side characters. They both go through various trials and travails in love throughout the book, but you get the feeling that things will go well for them eventually. When I say that Mark and Kate are nice, I don't mean prosaically boring. Kate is super excited to meet her long-time crush/sorta long distance girlfriend. But the she is incredibly intimidated. Violet is accomplished, poised, and very grown-up seeming. Violet, like many teenagers (and many adults), doesn't have the self-confidence to see herself as worthy of being loved by someone so perfect. So she does some really dumb things to avoid Violet. As a result I spent much of the book being frustrated with her. I understood her reasons, but I frequently wanted to grab her by the shoulders and shake her. Mark is an easier person spend time with as a character. I think it could also be a difference between the writing styles of Nina and David that I felt more comfortable and sympathetic towards Mark...but it's hard to say. Mark is a nice kid, but just as emo in his way as Kate. He's been in love with his best friend since forever. But he increasingly realizes that his friend isn't into him after all; it's not that he's scared about coming out officially. Moreover circumstances in the book push Mark to decide who he wants to be. He's the type of kid who impresses a lot of other people and he has yet to embrace that he is worthy of that acclaim - not in the self-conceited sense but in the self-assured sense. The non-spoken theme of this book really is one of self-discovery and encouragement to be self-confident. But the more overt theme is the friendship between Mark and Kate. I love that they see things in each other that old friends don't, because they don't have the baggage of history. They encourage each other, rely on each other, and generally make the other person better. 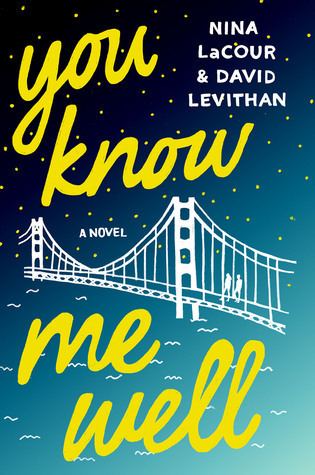 Another thing that I loved about this book is that it's about two LGBT teens (a lot more than two, but two main characters) having regular teenage angst and relationships. For the most part, the fact that they're LGBT is not an issue. It just is. And that's an important leap for YA books to take. Overall, I enjoyed this book. It was a quick read and fun. Not super memorable. I can't exactly explain why. I liked the writing, but there wasn't that intangible "It" factor that made me fall in love with it. But that's the case with many if not most books. This is a worthy and fun YA book to fill your reading time. Recommendation: Borrow unless you're a David Levithan or Nina LaCour completist. I felt the same way. This was a nice book and I really think it should be widely read... but I was expecting it to pack a little more emotions than it did. And I definitely liked Mark better than Kate. Mark was such a good friend!! I'd love to have someone like him in my life! I also liked this one and the focus on friendship more so than the romance aspect. I also appreciated the fact that feature teens who are uncertain of their futures or have anxiety about starting a new chapter in their lives.